It’s very spacious, lots of room around the aisles. Pricing is consistent with other area Goodwills ($4.99 for a women’s long-sleeve shirt), and items are sorted by category then color. In the connecting hallway at the back I spotted four dressing rooms, which seems like low capacity for a store this size. Sunday 11 a.m. to 6 a.m. 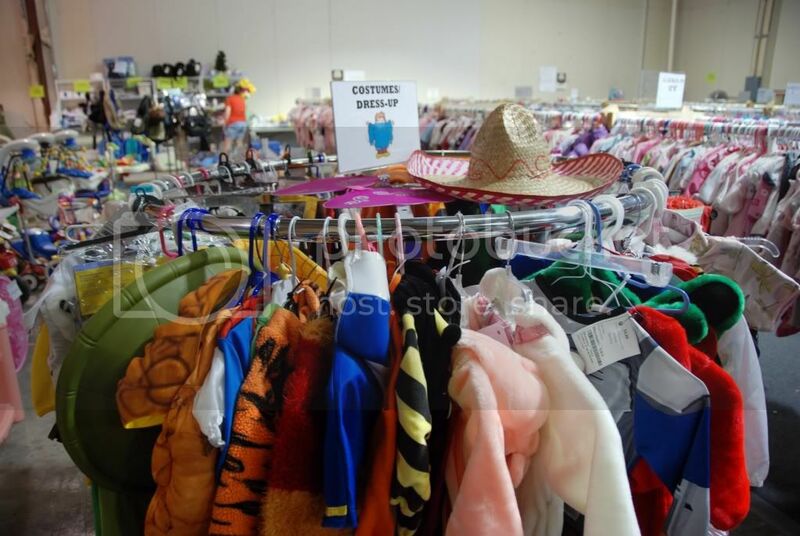 I browsed by a new thrift location last week – Children’s Hospital of the Kings Daughters (CHKD) store at 8032 W. Broad St.
CHKD supports Children’s Hospital of The King’s Daughters Health System based in Norfolk. 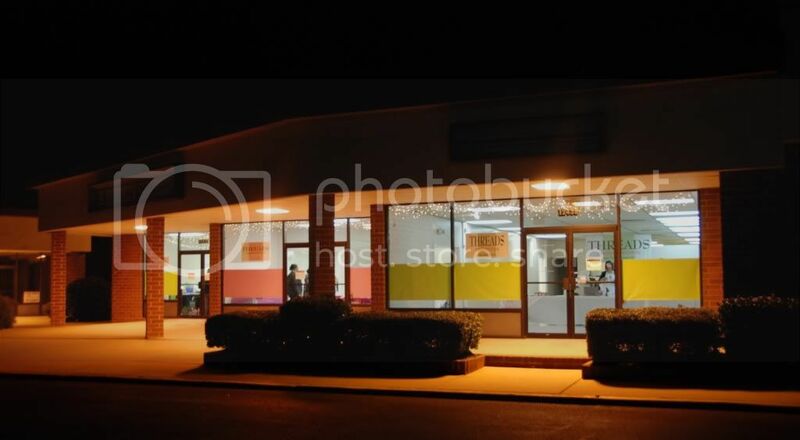 It already has Richmond thrift store locations at 91 S. Laburnum Ave and 8278 Midlothian Turnpike. The day to go is Monday – receive a 25% off coupon for Mondays by texting KIDS 30 to 71441. Alternatively, a sign in the store stated that members of the military receive 20% off on Mondays. As is the case with pretty much all my reviews, I had the boys with me and didn’t have opportunity to make nearly as thourough an examination as I would have liked… except of the toy section. I can confidently state that the toy wall had an interesting assortment of stuffed animals, and little toy grab bags priced $2.98. First impression is that I like the spaciousness afforded by the high ceilings and somewhat spread out shelves. Men’s, women’s, and children’s clothes are on racks sorted by gender and type – like women’s shorts – but not color or style. There was a mirror but no dressing room. 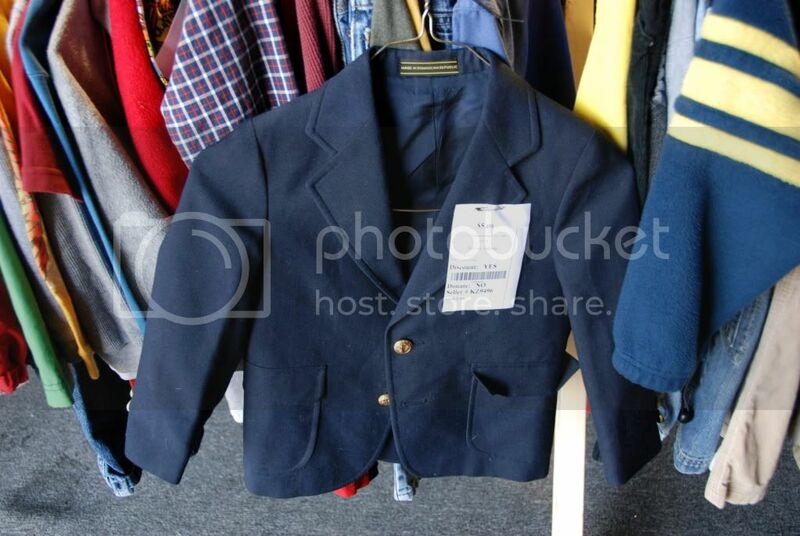 All items are individually priced, with hand-written tags in the case of clothing (think Fan Thrift). Prices for women’s items seemed to fall in the $3-$5 range, more for dresses and coats. I didn’t see any discounted items, but the first round of markdowns may not have happened yet since it’s a new store. Around the perimeter of the store were the miscellaneous housewares, electronics, and toys, and some jewelry in a case at the register. 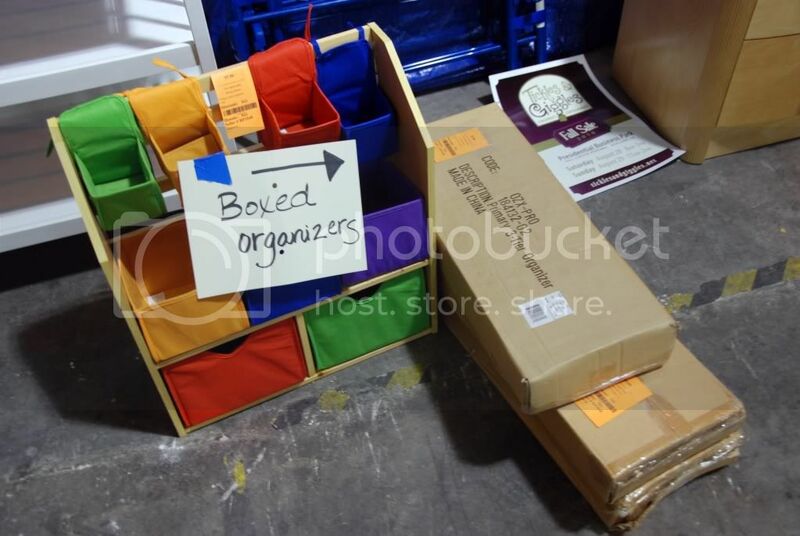 There’s a shelf just to the left of the entrance to leave donations, or it appeared that they could be left inside the first set of doors when the store was closed. 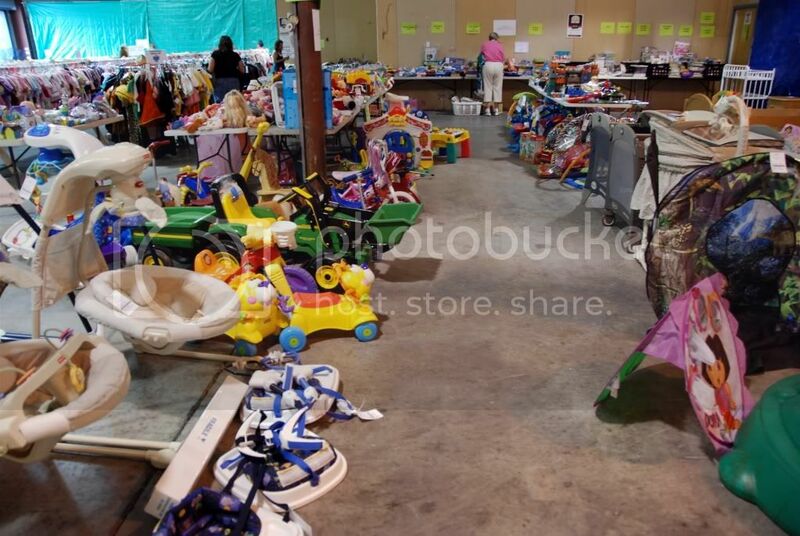 To schedule a pick-up of items (Monday through Friday) call (855) 299-KIDS. I stopped and shopped Pieces Boutique + Consignment last week because I had purchased a Groupon for it a few months ago. My mom was watching the boys that afternoon so I had the distinct luxury of trying items on sans screaming AND not having the dressing room curtain pulled open in the process. So obviously I have a positive impression of the experience. Women’s clothes were sorted by style (tanks, dresses, jeans, shirts, etc.) and size. Many of the items were basic, preppy pieces with brands such as Ann Taylor, J. Crew, Ralph Lauren, and so on well-represented. Prices started around $6 and went to at least $40, but the majority of tops I browsed fell in the $10-$20 range. 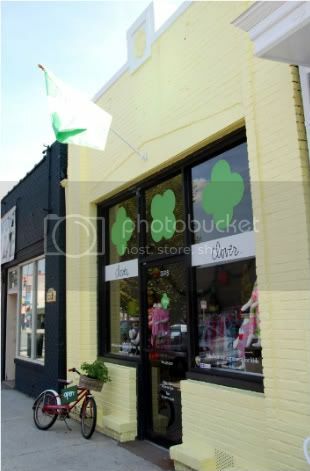 The store also carries accessories, shoes, and mens clothing. Look for pink stickers on the backs of tags to denote items 50% off! Ashby, sister store to Carytown consignment shops Clementine and Clover, opened yesterday. Clementine has been testing the waters with periodic “Weekend Warehouse” sales this spring/summer. Located in Richmond, Virginia, Ashby is a consignment shop for young women who are looking for the latest trends at affordable prices. Ashby offers the latest trends in a variety of styles. Most items are $5-30. You’ll find hundreds of great clothes from today’s hottest brands, including American Eagle, Abercrombie, Forever 21, Free People, Gap, H&M, Hollister, JCrew, Steve Madden, and Urban Outfitters. We also carry new jewelry and accessories handpicked by our staff. We take clothes, shoes, and accessories (except jewelry) on consignment by season every Thursday and Sunday; no appointment is needed. Consignors get 50% of the sale with no fees. Back in February, we tried City Dogs restaurant on West Main for lunch, using a Seize The Deal certificate from last year. City Dogs serves casual fare – burgers, sandwiches, and of course, hot dogs. Most specialty dogs are $3.29 apiece. The Richmond Original (front) is regularly $2.29 and comes with onions, mustard and chili. We also tried the Miami in soy, and the Honolulu (with pineapple! pictured in back). The dog was tasty (though I was tasting chili and onions all day!). My only quibble was that I would have liked a slightly more substantial bun. Two Richmond Originals would make a nice, filling meal for me. Why should you care about City Dogs? Well, every Tuesday all day at the West Main location, you can get the Richmond Original dog for just $1. There is a second City Dogs location on E Cary in Shockoe, which offers the $1 Richmond Original special on Mondays. As I posted on Facebook, last Friday I swung by Love of Jesus Thriftique in the far West End to check out the new thrift store during its grand opening weekend. I gripe from time to time about Southside and East End having all the thrift stores, so I was excited to see what the Thriftique had to offer. 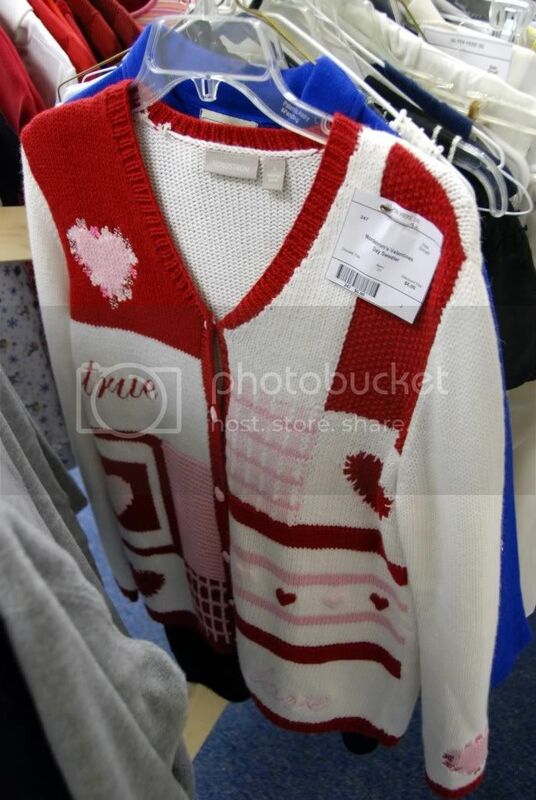 Love of Jesus Thriftique is located next to the Food Lion in Lauderdale Shopping Center, at the corner of Church and Lauderdale (3091 Lauderdale Dr). 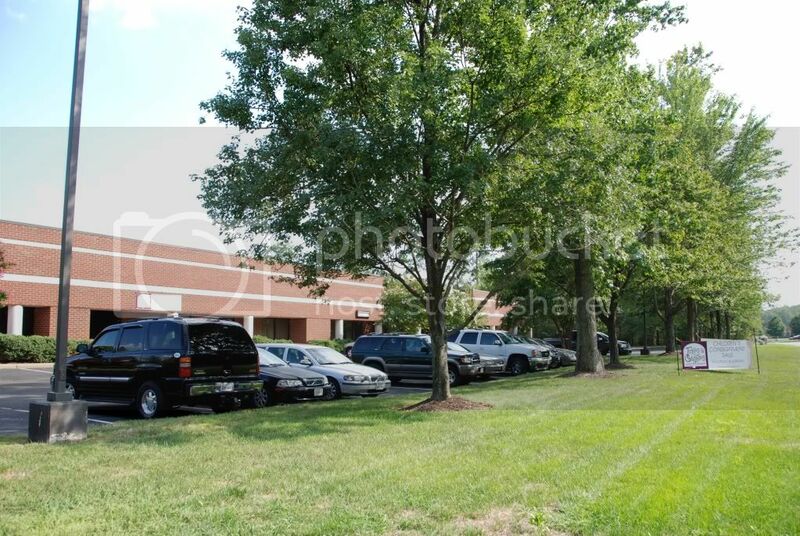 It’s only about two minutes’ drive south of Short Pump Town Center. If the name sounds familiar, it’s because there are already two “Love of Jesus Thrift Stores” operating in Richmond, at 5503 Midlothian Tpk and 5158 Nine Mile Road. All three shops are run by The ROC church, and the proceeds benefit its Richmond ministries. The store carries clothes, shoes, books/music/DVD’s, housewares, and furniture. There was even a rack of wedding dresses at the front. Taking a cue from Goodwill and its Second Debut shop in Carytown carrying a selection of higher-end brand names culled from donations all over, Love of Jesus Thrift is attempting to collect some of its nicer inventory into one place, hence the “Thriftique” and some correspondingly higher price tags. Those familiar with the other stores might suffer sticker shock at the Thriftique. 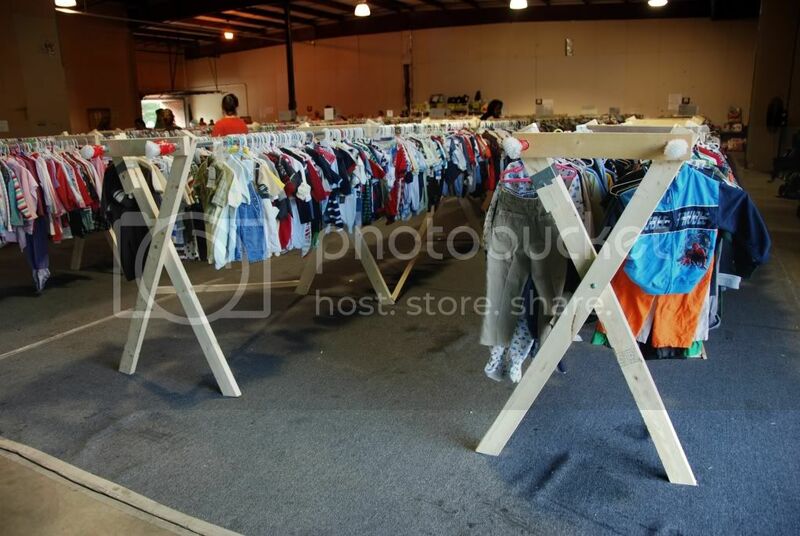 Instead of clothes in the $1 range, prices begin at $1.99 for infants items and jump to around $5 for adults. A few folks on Facebook echoed my sentiments that the prices seemed a little high for thrift. However, there were some nice quality pieces that absolutely justified the markups, such as a new-with-tags Hartstrings boys’ sweater for $5, tag price $65. 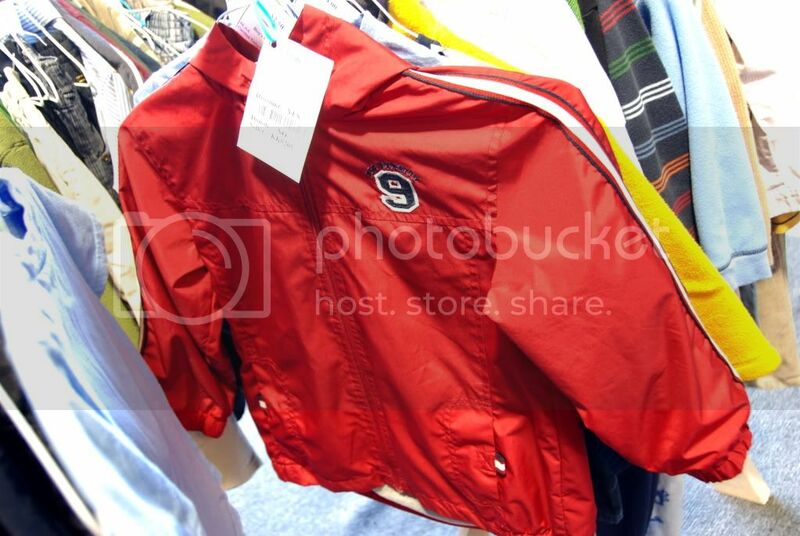 In the boys clothing I also saw Polo, Gymboree, etc. Books were $2 softcover, $3 hardcover. Furniture prices went up to about $100. During our shopping trip we had the store mostly to ourselves (the West End has not yet discovered it), and the staff were very pleasant. They found small toys – a truck and a stuffed Chick-fil-A cow – for my boys to play with, and gave me a free t-shirt and balloon at checkout. I wish I’d had longer than 15 minutes to browse, but even bribed with toys, my little guys do not like to shop. I’m glad the Love of Jesus has decided to extend its thrift empire to the West End, and look forward to shopping again! Sunday through Friday 9:30 a.m. to 6 p.m. I won’t lie, one of the perks of blogging is being invited to shop consignment pre-sales. Tonight I had the chance to check out Threads fall/winter women’s consignment sale. Threads is located in the Gayton Centre Shopping Center in the far West End, just a couple doors down from Ollie’s Bargain Outlet. In addition to tops/skirts/slacks/dresses, it also carries shoes, handbags, formal wear, coats, maternity, jewelry and even some books. Even though it’s not a huge sale, I was pleased with the selection, quality, and prices in my clothing size. Shirts started at $2, with many in the $4 to $6 range. Pants were mostly priced $4 to $10, and skirts $7 to $15. Brands represented included Ann Taylor, Talbot’s, Gap, Banana Republic, The Limited, and more. The sale has several dressing rooms available, of which I availed myself. I ended up making off with a pair of Limited black pants ($5), Ann Taylor capris ($3), Gap basic shirts ($3 for 3), and a pair of Old Navy maternity pants ($4). I didn’t have any luck with shoes – they mostly were larger sizes starting with a plethora of size 8’s! 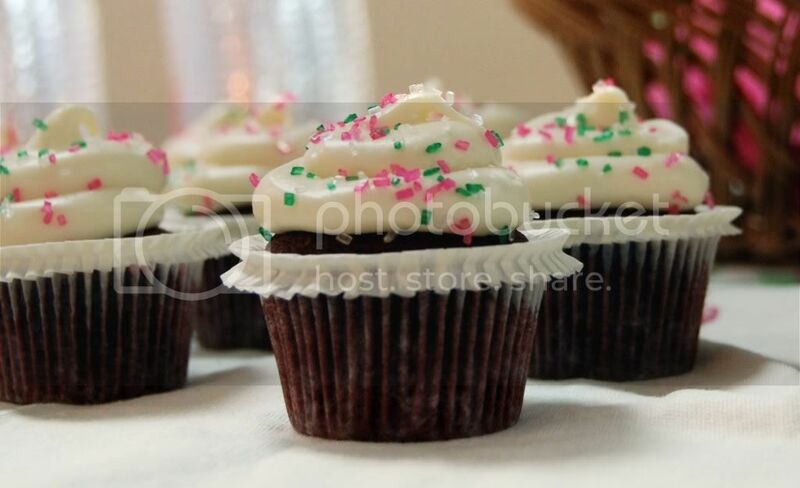 Two Sweet cupcakes being served! 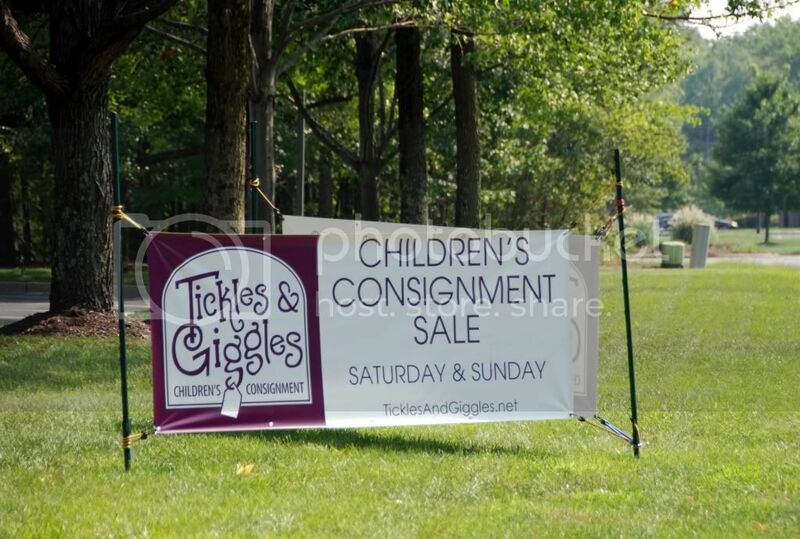 I had the opportunity to preview Tickles & Giggles children’s consignment sale this afternoon. It’s located in Ashland and easy to find – take exit 92B off I-95, then turn left at the first traffic light (Hill Carter Parkway). You’ll pass a Walmart and about a mile down the road on the left is Presidential Office Park, in which Tickles & Giggles is located. A portion of the sale proceeds and any unclaimed items are donated to the charity Hanover Safe Place. Want to see the sale for yourself? There is no other word for it, Clover is cute. The store is cute, the clothes are cute, even the logo font is cute. 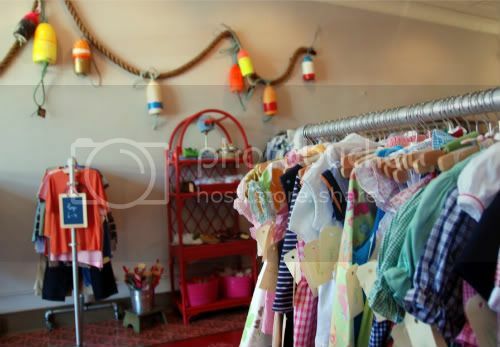 Launched by the owners of women’s boutique Clementine (located just across the street in Carytown), Clover is a kids re-sale boutique specializing in “top” brands such as Baby Lulu, Crew Cuts, Hanna Andersson, Lacoste, Mini Boden, Oilily, Silly Goose, Tea, and Zutano. When I stopped by on Friday, I was in the fortunate and rare state of being child-free, so I didn’t have to take advantage of the children’s play and movie area at the back of the store. Browsing the racks was an enjoyable experience; everything is just so darn CUTE. Even the boys things were cute, and they usually get short-changed. They do get slightly short-changed with selection, as is the case at every place which sells second-hand children’s items. While I was initially a bit intimidated by the list of brands Clover carries, a good two-thirds of which I do not know (Gap is high-end to me! 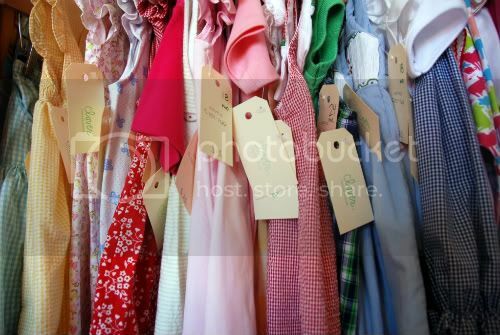 ), there were plenty of familiar labels on the hangers as well – Janie & Jack, Gymboree, Gap, Land’s End, and one or two pieces of Old Navy. One aspect I appreciated was that the inventory included some items with slight imperfections, like a very faint spot, all noted on the tags and priced slightly lower to reflect. Despite the handwritten price tags that are to-die-for adorable, prices are the to-be-expected exception to the cute rule at Clover. I realize they represent significant savings over buying new, but even second-hand, boutique brands don’t come cheap. 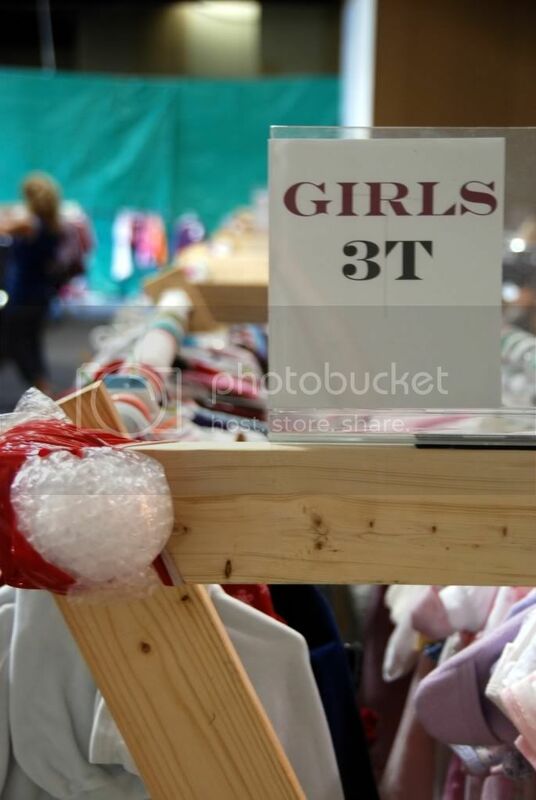 Clover’s prices appeared to run from around $5 (for some boys tees) to $35 (girls smocked dresses). Since my usual goal is to pay less than $5 per item of clothing, I didn’t find a lot in my budget. However, as my son grows, I have definitely come to appreciate the better fit and longer wear of higher-end brands, and I could see myself buying a piece or two a season that I just loved. It would not be hard to find at Clover! Obviously the store hasn’t been in business long enough for items to reach the markdown stage, but the discount schedule will be Full Price for 30 days, 50% Off for 15 days, and 75% Off for final 15 days. 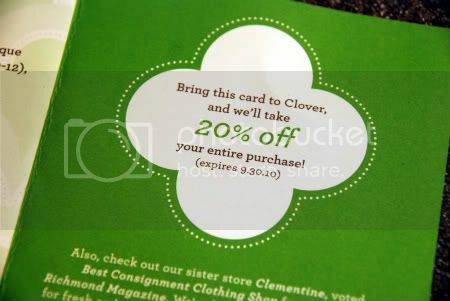 And if you’re going shopping, stop by Clementine to browse first and pick up a coupon card for Clover (sitting in basket to right of door) – 20% off your purchase through 9/30. If you’ve been, what do you think?